Charlton chief Lee Bowyer believes Luton are nailed on to get promoted this season, despite his side inflicting the Hatters’ first League One defeat in six months. 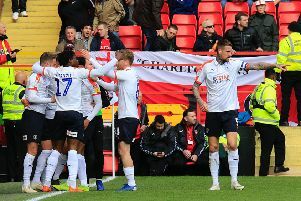 The 3-1 result at The Valley kept alive the Londoners’ outside hopes of achieving automatic promotion, while reducing Town’s lead at the top to just five points. With four games to go, Luton’s destiny is still in their own hands and Bowyer believes they ‘deserve’ to be playing Championship football next term. The Addicks manager said: "I thought we were good from start to finish. "You’ve got to remember, we’re playing against a team that will go up. They’re going to go up. “We played Luton quite early in the season and I thought we were better than then on that day and I couldn’t understand how they’ve gone so many games without losing, but I just witnessed why, because they are a very, very, very good side. “They’ve got good players, they’re solid, they’ve got good energy, they move the ball well. "We pressed really, really high and fast and they just popped it around us at times. “It was a game of two good footballing sides. Two good, hard-working sides and I could see why Luton have gone on that run they’ve been on. Bowyer saw Harry Cornick give Luton the lead on 15 minutes, but Charlton were far from second best in a pulsating first half. However, his side were the only team in the contest after the break and two goals from Lyle Taylor either side of a strike from Igor Vetokele comfortably ended Town’s 28-game undefeated streak. Luton also saw out the game with 10 men after a late second yellow for midfielder Andrew Shinnie, but Bowyer thought the visitors should have had reduced numbers from the 30th minute when keeper James Shea fouled Vetokele outside the area. 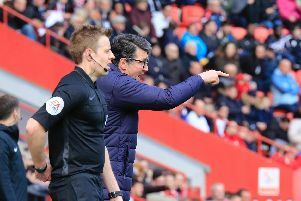 “It was a red card,” the Addicks boss said, adding: “From what I understand, the reason he (referee Gavin Ward) didn’t send him off was because Igor had already taken the shot. "If that is the case, from what I know about the rules, is that it was an erratic challenge and the goalie wasn’t in control of his body because he came sprinting out at 100 miles an hour and took Igor out. It was a bad tackle. “If that was anywhere else on the pitch, from an outfield player, then it’s a red card.